Consider them third-wave cocktails. Minimizing alcohol, high-end spots like ROKC and the Pool Lounge both label drinks by their dominant flavors (chamomile, cucumber, raspberry, lychee, pistachio), then list a range of fanciful ingredients that intend to wash out the liquor itself. In a way, gastronomy built a bridge to sobriety that mixology wouldn’t dare. So, it’s no wonder low-ABV cocktails and mocktails have become enshrined recently on bar menus at the NoMad and Mother of Pearl. And, while you could always order a virgin daiquiri or spritz anywhere, these dry innovations come complete with all the garnish, complexity and bite of their boozy brethren without the drunk texts and killer hangovers. What better time than temperance-soaked Dryuary to test-drive the sober route? If only all New Year’s resolutions were this easy to swallow. Evocative of a sunny morning in French Polynesia, this mocktail for two from a teetotaling beverage director is garnished with orchids and mixed with passion fruit and guava purees, honey syrup and cold-brew concentrate to get you buzzed in a healthy kind of way. 121 W 10th St (212-243-2827, slowlyshirley.com). $29. Though this classic Peruvian drink gets its rich magenta color from boiled purple corn, its dynamic flavor comes from the balance of sweet apple, cinnamon and cloves stirred with tart pineapple and spicy ginger, for a funky twist on a familiar Latin flavor. 28 W 44th St (212-221-9560, sensakana.com). $12. This riff on an old-fashioned is anything but. Smoky lapsang souchong tea substitutes for whiskey, molasses syrup replaces a sugar cube, and a dash of apple vinegar gives the faux cocktail Don Draper–level sharpness, minus Don Draper–level bad decisions. 177 Prince St (212-328-7880, pinchchinese.com). $9. Despite its name, the Baker’s Dozen has a whopping 19 ingredients. 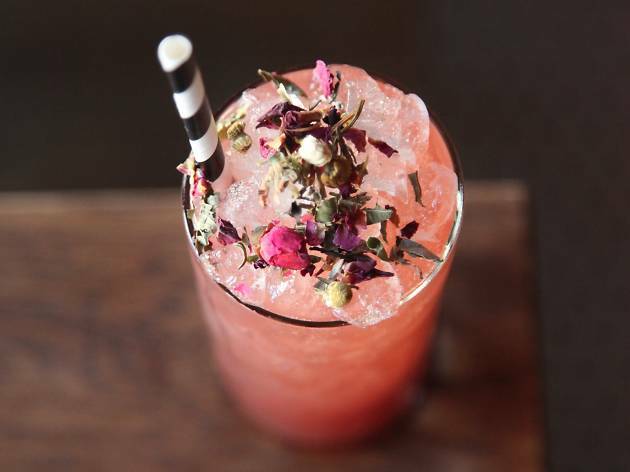 But what gives the drink its bite—so that it doesn’t just taste like a new-age smoothie—is the puckering combination of fig gastrique, Szechuan peppercorn, lime juice, cinchona bark, coriander and allspice. And that’s only a fraction of the flavors. 29-12 23rd Ave, Queens (718-274-2105, thebonnie.com). $9. Thank God someone is keeping the mockery in mocktails. Now you can hoover candy in a slightly more grown-up fashion—from a shot glass. The Candy Land theme comes full circle with the addition of two chocolate-dipped Pocky sticks inside the glass and a little plastic dinosaur hanging off the rim. 21 A Clinton St (212-228-2100, caveat.nyc). $3. 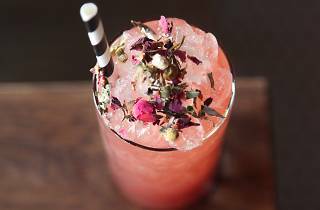 It’s not surprising that a restaurant called The Fat Radish serves a mocktail that uses a liquor-free spirit named Seedlip Garden 108 as its main ingredient. Though the drink looks like a compressed watermelon, with a bright green base and a nigella seed-sprinkled top, its dry concoction of macerated peas, hay, spearmint, rosemary and thyme mixes with aquafaba (chickpea meringue) plus celery, apple and lemon juices for a treat that’s more earthy and complex than your average summer wedge. 17 Orchard St (212-300-4053, thefatradishnyc.com). $11.